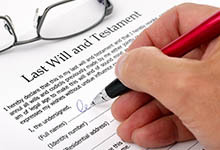 Establishing a legal will is an essential part of any estate planning endeavor. Many people assume they are too young or just don’t have enough assets to warrant drafting a legal will. However, illness and injury can strike at any age and even if you only have a car and a modest bank account, you have assets that will need to be settled or divided. Once you have children, a will definitely needs to be drafted to ensure those children are cared for in every way. This will should include everything from who raises them to what finances are allotted for their care. When you are ready to ensure your wishes are upheld and want to protect all you have worked for, estate planning attorney George C. Malonis will help you construct a legal will that accomplishes exactly what need it to. When it comes to finalizing a will, it may be necessary to re-evaluate the worth of some assets. It can also be necessary to draft a comprehensive list of assets, including real estate, collectibles such as art or jewelry, bank accounts, retirement accounts, insurance policies, and stock or other investments. If there is a family business to consider, it will be necessary to weigh the options for fair and sensible division of that business or shares of that business. The decisions that are necessary when it comes to drafting a will or a legal trust can be highly personal and even overwhelming to think about. With George C. Malonis handling the legal end of the process, you can rest assured that a clear-headed and dedicated professional is working to ensure your wishes are followed and your decisions are secure. With a legal, valid and comprehensive will in place long before it is needed, you can minimize family disputes and also find peace in the fact that your wishes and assets will be cared for as you see fit. Without a will, your family and closest confidants will literally have no say in what happens to all you have worked for and all you value. The fight to keep property, assets and financial holdings could be financially draining on those you care for most. Even worse than having no control or say in the allocation of property or funds would be having no real say in the care of minor children. There is simply too much at stake to not make estate planning a priority. With George C. Malonis in your corner, your rights, property, assets, finances, and care of minor children will be secured and executed as you see fit.